If you want to succeed, it never hurts to dream big. Ask any entrepreneur what their goals are, and their responses likely boil down to one thing: Growing bigger. They want to make a name for their business, increase marketplace visibility, close more sales, earn more revenue, expand the teams to do the work, and secure a spot in the annals of industry success. In other words, they want to build an enterprise. And there’s a good chance they’ll rely on techniques like content marketing to help them reach that goal. Of course, content marketers who work at a company that’s achieved enterprise status understand the pursuit of growth never ends; it just plays out on a much larger and more complicated field of dreams. 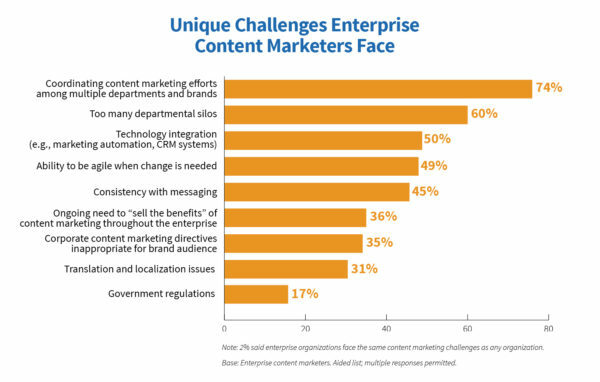 Just how much does the content marketing game change at the enterprise level? 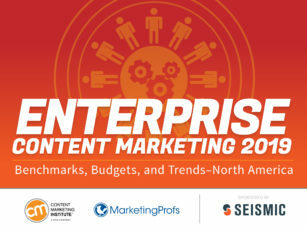 That’s a question the CMI team looked to explore in detail with our latest research study Enterprise Content Marketing 2019: Benchmarks, Budgets, and Trends—North America sponsored by Seismic. Although those at smaller organizations might assume the enterprise grass is greener, content marketers who operate in these larger, more complex organizations know that isn’t necessarily so. Every marketing team has its challenges, but when a company has thousands of employees working across multiple brands, product lines, office locations, and functional silos, every hurdle feels like it’s amplified by 1,000. Could some of these issues be a byproduct of how bigger businesses are often structured? If you look at the two most frequently cited challenges, this theory makes sense. The bigger and more distributed an organization, the harder it is for all the business units, product groups, and other siloed teams to know the content being created and distributed, the targeted audiences, or the measurements for success. And, when it comes to strategy-driven initiatives like brand-wide storytelling, even small communication breakdowns can lead to big problems – duplicated efforts, inconsistent or conflicted messaging, wasted budget, or worse, lower marketing ROI for the business. Because it relies on a dedicated team to create and deliver all content solutions, this structure can increase understanding of campaign performance across the business and reduce duplicated or off-strategy efforts. Yet, according to our research, only 26% of enterprise marketers say their business relies on this structure – though 38% work under a hybrid model, which operates with both a centralized group and individual teams. No one structure is right for all enterprise teams. But NASCAR attributes the recent success of its Facebook Watch documentary, Behind the Wall: Bubba Wallace, to its decision to centralize its content team. 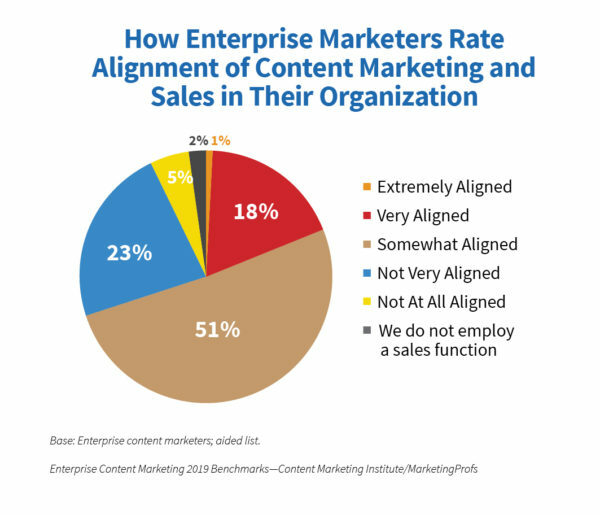 Alignment between sales and content marketing teams is another issue we examined in our enterprise research. Though these two functions are commonly managed in distinct business units – regardless of the size of the organization – the ability to share audience insights, collaborate, and inform each other’s strategies and priorities is critical for enterprises whose content goals include increasing leads, conversions, and purchases. An uptick in interest in account-based marketing (ABM) might narrow that alignment gap. ABM requires strong collaboration between sales and marketing, as the technique involves focusing on a clearly defined set of target accounts identified by sales and deployment of custom-designed marketing campaigns to resonate with those accounts. Encouragingly, a recent custom research study CMI conducted with LinkedIn found an association between ABM and better sales and marketing alignment. Furthermore, 87% of respondents in an ITSMA benchmark report say the technique drives higher ROI than any marketing they do. 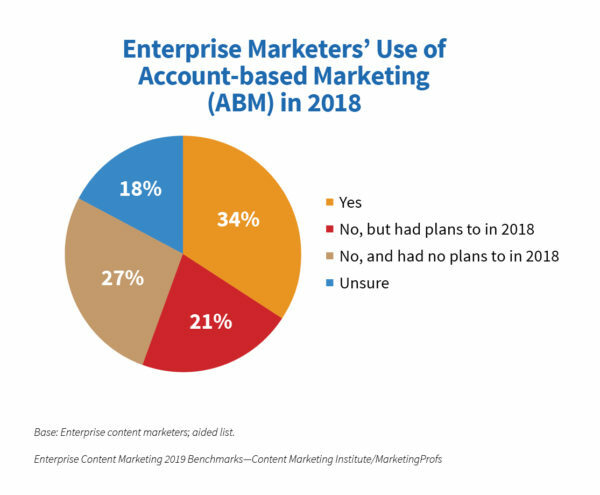 And the findings from our annual survey indicate enterprise content marketers are willing to give the technique a shot: 34% of respondents said they currently use ABM, and another 21% said they planned to incorporate it prior to the end of 2018. In CCO last year, Joe Chernov elaborated on the give-and-take required in an ABM approach. “Collaboratively, get really specific about the attributes of the companies you’re trying to sell to. Then, and only then, go about figuring out who is going to do what and when to try to get in front of these organizations. No matter how their teams are structured or what content marketing techniques they work with, enterprise marketers must generate, analyze, and apply high-quality data about their audience’s needs and interests. And these days, this simply can’t be done at scale without putting a little technological muscle behind their processes. In addition to the survey’s organization-focused questions, our research team also looked at the use of technology among enterprise marketers, approaching the topic from several angles. 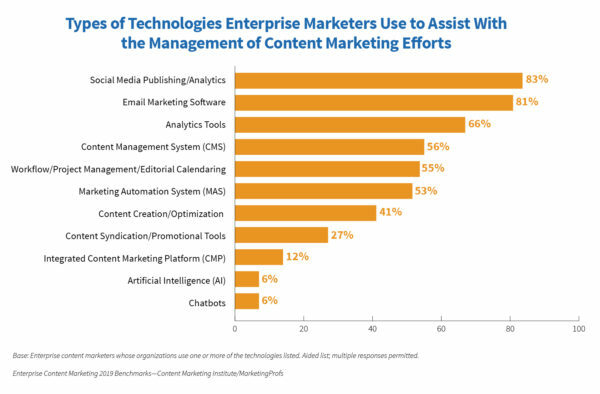 First, we looked at the types of technologies used by enterprise content marketers. Considering how critical measuring performance is to demonstrating success, it should come as no surprise that 66% of respondents use analytics tools. In addition, 83% work with social media tools, including those concerning analytics. Only 24% rate their organization’s proficiency with using content marketing technology as expert or advanced. 38% consider their proficiency to be at the intermediate level. 36% are at the novice or beginner stages. You may have noticed that, among the most frequently cited challenges at the beginning of this article, half of our survey respondents (50%) reported that integrating technology is a unique challenge faced by their type of organization. 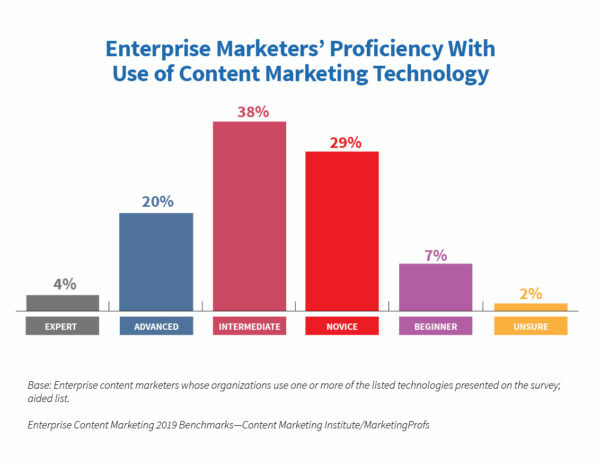 Considering how many marketers seem to be struggling to understand, incorporate, and apply content marketing technologies successfully across the enterprise, it might be wise for these businesses to invest more heavily in team-wide tech training and education opportunities. Encouraging observation and reflection: Ask your team to monitor (and share) new tools as they emerge, including use cases, potential applications, and foreseeable risks or pitfalls. Creating a technology sandbox: Give your team a space for hands-on experimentation to build skills and experience in-house before offering the innovative solutions to clients. Nourishing curiosity: Hire naturally innovative people and give them the space to do just that. Can tech make marketers better at engaging audiences? Level of expertise aside, our research team was also interested in the kinds of benefits enterprise marketers think their tech tools are helping them achieve. 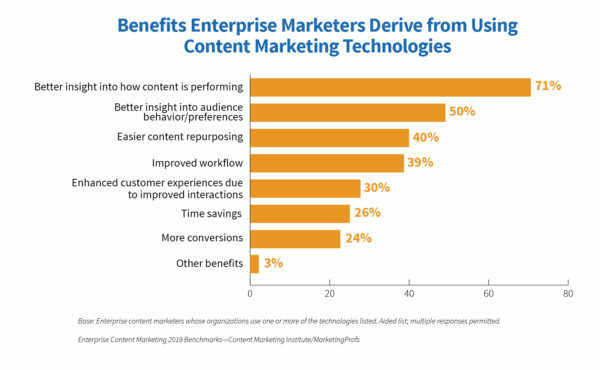 The top benefit (by a wide margin) was better insight into how content is performing (71%). But it’s the next-highest response that piqued our curiosity from a brand storytelling standpoint: 50% of respondents indicated that content marketing technology provides better insight into audience behavior/preferences – a significant advantage when it comes to knowing how to create and distribute valuable content experiences. Only 59% always or frequently prioritize the audience’s informational needs over their sales/promotional message. Only 50% prioritize delivering the right content to the right audience at optimal times. 46% of these marketers always or frequently craft content based on points or stages of the buyer’s journey. Delivering the content your audience members want – when and how they want it – should be a top priority of any successful content marketing program. As Robert Rose recently pointed out, if you want to have an influence on a consumer’s moments of truth, you first need to win their trust – something you can’t hope to achieve if your content is only focused on your brand’s interests. How does your enterprise measure up? 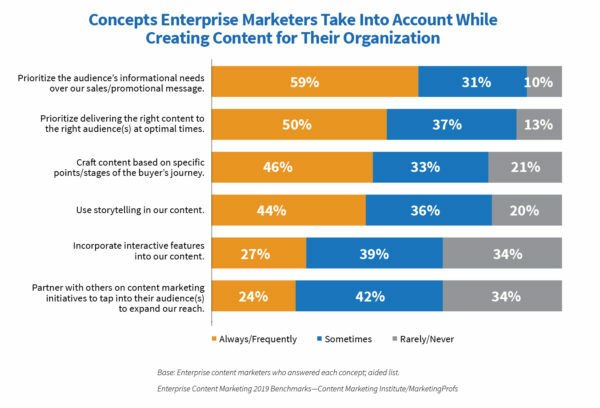 These are a few of the compelling findings from our latest research on content marketing at enterprise organizations. 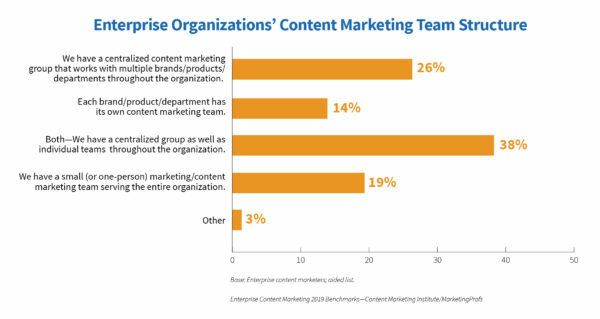 To get a more complete picture of how your marketing peers are responding to important industry trends, pursuing key opportunities, and furthering their content marketing success, download the full report Enterprise Content Marketing 2019: Benchmarks, Budgets, and Trends—North America today. Of course, we would love for you to share your experiences with these enterprise marketing challenges and advantages – or your suggestions on other enterprise-related issues you’d like us to explore in future research studies. Let us know your thoughts in the comments. Improve your relationship with content marketing technology this April. Make plans to attend ContentTECH Summit in San Diego. Use the code BLOG100 to save $100.